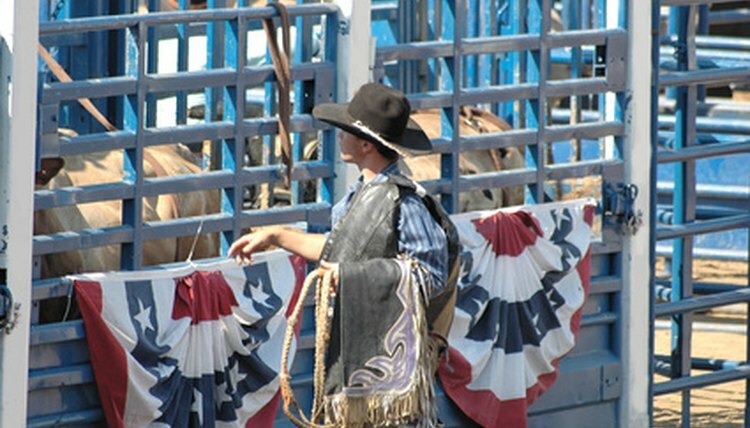 It is important to design and build bucking chutes or any livestock handling facility to prevent injury and stress to animals and people. Sharp corners and protruding objects should be avoided and the chutes should be sturdy enough to stay together during use. Exposed nail tips should be bent at a 90-degree angle back into the wood. Bucking chute plans are available from the University of Tennessee and North Dakota State University. The plans from North Dakota State are used below to describe the building process because they are easier to read. In the directions, right and left sides are designated by standing in front and facing the chute. Dig a post hole 3 feet deep at each corner of the chute. Dimensions of the chute are 3 feet 6 inches wide and 8 feet long. Measurements are made from center to center of the holes. Dig a second post hole 6 inches to the outside of each previously dug hole on the front and back of the chute. Place 8-inch diameter wooden posts 11 feet long in each hole and finish filling the hole with concrete. When setting the poles, remeasure the chute dimensions to ensure the poles are in the right position. Use a level to make sure they are completely vertical. Build the back wall of the chute by nailing 2-inch by 6-inch lumber 8 feet long to the inner posts Place the bottom board 4 inches off the ground and the remaining three boards 1 foot apart. Use 16-penny nails. Cut two pieces of 2-inch by 8-inch lumber to a length of 13 1/4 inches with a circular of hand saw. Nail one of these boards with 16-penny nails across the two posts at each end of the chute on the front side. Bottom edges of the boards should be 6 foot 10 inches from the ground. These pieces will serve as stops for the slide gates. Cut two lengths of 2-inch diameter pipe to 9 feet 8 inch lengths with a pipe cutter. Fasten a pipe on each end of the chute between the posts at a height of 7 feet from the ground to the center of the pipe. The pipe needs to rest on the 2-inch by 8-inch block at the front of the chute with the end flush with the posts. Measure and cut holes for 5/8-inch machine bolts in the pipe with a cutting torch and through the posts with an electric drill containing a 8-inch long bit. Attach the pipe between the two posts with 5/8-inch by 18-inch carriage bolts. Securely tighten the nuts onto the bolts. The slide gates will hang from these two pipes. Weld a 1/2-inch by 1 1/2-inch steel stop on the protruding end of each pipe to act as gate stops. Cut seven pieces of 1-inch by 6-inch lumber to 6 feet 6 inches in length. Cut four pieces of 2-inch by 4-inch lumber to 4 feet in length. Place the cut lumber on the ground to form one of the slide gates. Outside dimensions of the gate are 4 feet wide and 6 feet 6 inches high. The 2-by-4s are the vertical pieces and the 1-by-6s are the horizontal pieces. The 1-by-6s need to be evenly spaced with outside edges of the end boards flush with the ends of the 2-by-4s. A 2-by-4 is placed vertically on each side of the gate ends. Fasten the boards together with 3/8-inch by 4-inch carriage bolts. Drill 1/2-inch holes for the bolts in which to insert the bolts. Cut two 2-by-6s at an angle to fit between the 2-by-4s and run diagonal across the gate from the upper left corner to bottom right corner to form a brace. A brace is attached in the same position on each side of the gate with 16-penny nails. Bend two pieces of 1/4-inch by 3-inch flat bar strap around the 2-inch pipe so that the ends are the same length. Bolt an end to each side of the top of the slide gate with two 3/8-inch by 4 1/2-inch machine bolts. The straps should be hung just inside the front chute posts and just outside of the back posts. The slide gate should hang in a position to completely cover the end of the chute when closed. Build the second slide in the same manner as the first one. Cut 11 2-inch by 6-inch lumber to a length of 7 feet and cut five pieces 6 feet long. Lay the pieces on the ground to form the gate. Outside dimensions are 7 feet wide and 6 feet high. The vertical pieces are positioned at the ends of the gate on both sides. Drill 1/2-inch holes in the four corners of the gate and fasten with 3/8-inch by 5-inch carriage bolts. The remaining pieces are fastened with 16-penny nails. Fasten the fifth 6-foot-long 2-by-6 vertically on the outside of the gate one foot from the vertical piece on the right end. Use 3/8-inch by 5-inch carriage bolts to attach the ends of the board and 8-penny nails for fastening it to the remaining horizontal pieces. Cut a brace to fit between the two vertical pieces on the left side of the gate. Attach the brace to the outside of the gate using 3/8-inch by 3 1/2-inch carriage bolts to fasten the board to the second from the bottom and second from the top horizontal pieces. Use 8-penny nails for attachment to the remaining horizontal boards. Screw a 90-degree hinge pin into the left gate post 1 foot above the ground and a second pin 4 feet above the first. Slip a 3/8-inch by 2-inch washer onto each pin and push them down as far as they will remain level. Weld the pins in place. Bolt the hinge straps to the left side of the gate in a position to match the pins. Fasten with 3/8-inch by 6-inch machine bolts. Hang the gate and fasten cotter pins through the hole at the top of the hinge pin to keep a bull from hooking the gate and lifting it off the hinges. Install a bolt latch on the right side of the gate.